Dixie Lawn Service Inc. has been in business for over 25 years performing D.O.T. Right-of-Way Mowing and professional lawn service. 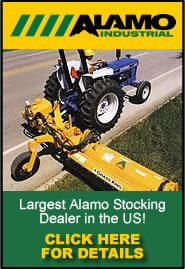 We are proud to be the largest Alamo Industrial dealer who sells and services the highest quality mowers, shredders and tree cutters. Alamo Industrial has name brands such as Triumph, Terrain King, Mott and McConnel. We stock many parts so we can service our customers. Please give our parts department (888-368-5659) a call for all of your parts needs. To better serve you please give us your equipment's model and serial number to insure the proper part is ordered. We also rent/lease mowing equipment. Please ask about this service for short or long term.